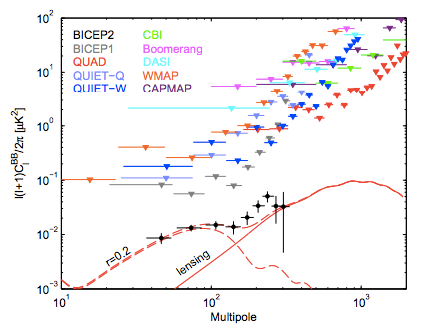 Well, it’s official that this afternoon’s announcement of a “major discovery” is going to be from the BICEP team, and it specifically concerns the BICEP2 CMB telescope experiment. I’ve just got back to Sussex (after a weekend in Cardiff) and will be following the events in among other things I have to do before going off to give a lecture at 5pm GMT. The schedule of events is as follows: there will be a special webcast presenting the first results from the BICEP2 CMB telescope. The webcast will begin with a presentation for scientists 10:45-11:30 EDT, followed by a news conference 12:00-1:00 EDT. EDT is four hours behind Greenwich Mean Time so the webcast will begin at 14:45 GMT, i.e. in about half an hour. 14:36 The press conference server has gone down. There’s no truth in the rumour that ex-members of the Clover collaboration have sabotaged it. 14:42 There’s a grave danger that this press conference will run into tea time. 14:53 Here’s the crucial graph. Results a bit higher than the expected signal at l in range 200-300? 15:06 The news avalanche has started, e.g. here at the BBC, but there is some concern about the shape of the spectrum. 15:10 I’m not getting anything from the press conference, so may have missed important details. It seems to me though that there’s a significant possibility of some of the polarization signal in E and B not being cosmological. This is a very interesting result, but I’d prefer to reserve judgement until it is confirmed by other experiments. 15:35 Despite the press hype there’s still some scepticism among cosmologists arising from the strange-looking shape of the spectrum. I’m not convinced myself. Anyway, I have to sign off now in order to prepare a lecture..
18:19 Returned from my 5pm Theoretical Physics lecture. Couldn’t resist spending 30 minutes talking about BICEP2, though I did tell them it’s not in the examination. There may be a connection between 1. and 2.-4. If 2.-4 are real then they may be evidence of something interesting that requires more than a straightforward modification of inflation (such as might include just a running of the spectral index). 18:35 Other controversy: why has this result been announced before the paper has been published or even peer-reviewed? This entry was posted on March 17, 2014 at 2:16 pm and is filed under Astrohype, The Universe and Stuff with tags BICEP, Bicep2, Cosmic Microwave Background, Cosmology, Inflation. You can follow any responses to this entry through the RSS 2.0 feed. You can leave a response, or trackback from your own site. Well you have me dying to find out even though I don’t think I will understand one word of the announcement when you explain it. I do get the one from the Harvard guy, but is he just being condescending :)?